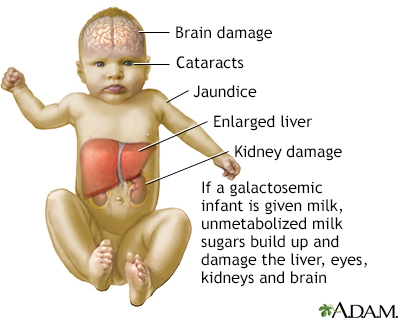 Infants with galactosemia can show symptoms in the first few days of life if they eat formula or breast milk that contains lactose. The symptoms may be due to a serious blood infection with the bacteria E coli. Berry GT. Classic galactosemia and clinical variant galactosemia. 2000 Feb 4 [Updated 2017 Mar 9]. In: Pagon RA, Adam MP, Ardinger HH, et al, eds. GeneReviews [Internet]. Seattle (WA): University of Washington, Seattle; 1993-2017. PMID: 20301691. www.ncbi.nlm.nih.gov/books/NBK1518/. Broomfield A, Brain C, Grunewald S. Galactosaemia: diagnosis, management and long-term outcome. Paediatrics and Child Health. 2015:25(3);113-118. Gibson KM, Pearl PL. Inborn errors of metabolism and the nervous system. In: Daroff RB, Jankovic J, Mazziotta JC, Pomeroy SL. Bradley's Neurology in Clinical Practice. 7th ed. Philadelphia, PA: Elsevier; 2016:chap 91. Maitra A. Diseases of infancy and childhood. Kumar V, Abbas AK, Aster JC, eds. Robbins and Cotran Pathologic Basis of Disease. 9th ed. Philadelphia, PA: Elsevier Saunders; 2015:chap 10.